The Glasgow back has not played since damaging ligaments in the Warriors’ clash with Munster in September. It was feared he would sit out the entire autumn series after he was initially ruled out for 10 to 12 weeks, but the British and Irish Lions full-back has recovered quickly. 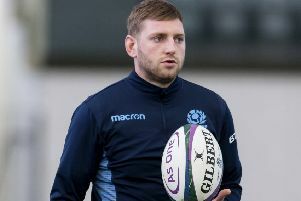 Head coach Gregor Townsend has decided to throw him straight back into action after naming a much-changed side to take on the Pacific Islanders at Murrayfield following last weekend’s defeat to Wales. Townsend said: “It’s a more experienced side this week in terms of time together at this level, while we’ve rewarded some of those who performed well off the bench with the chance to start. He added: “Fiji score more tries than any team in the world off turnover ball, about 66 per cent, whereas most teams are under about 10 or 15 per cent, so if you repeatedly give them turnover ball it’ll be a tough afternoon.